This week I am already six week along with my baby and on top of my pregnancy symptoms, I had to deal with irritating flu bug that lasted for days. Also, both my Mom-in-Law and Sister-in-Law had advised me to start seeing another Gynae who practices in a famous and new hospital in town. To me, seeing a doctor who practices in a famous and new hospital implies long queue, more expensive medical bills and less than 10 minutes consultation time with each patient. Actually, I have no problems with my current Gynae and in fact, I feel comfortable in her care. The problem is, she practices in a somewhat old maternity hospital in town and we are worried if this hospital doesn't have good facilities like the new one. In the end, my husband and I followed my Mom-in-Law's and Sister-in-Law's advice and saw a Gynae from the other hospital. Feeling nauseous throughout the day, many times. Vomiting. I never puked like this in my entire life before. Trust me. Loss of appetite, due to my flu? Frequent urination at day and nights. Worst is, this often breaks my good night sleeps. Finding it harder to button up my pants. Yes, my stomach is slowly growing in size. No more drinking milk for pregnant women. These whole pregnancy symptoms that I feel this week really torture me and often make me me think of negative stuff like "What have I done to myself? ", "I knew what I signed up for but this is just too much" and "How time moves so slow..." A lot of people cheered me up by saying "Just enjoy your pregnancy!" However, I just could not figure how to enjoy the nausea or the vomiting part. In the end, I keep reminding myself to just be strong and face this like a mature woman. Anyhow, these crazy pregnancy symptoms will go away after week 12, correct? So let's just hanging there. In yellow circle: My baby at week 6. My baby's first ultrasound scan. The black peanut shell like bump (in yellow circles) in the above photos is actually my baby's 1,5cm amnion sac. 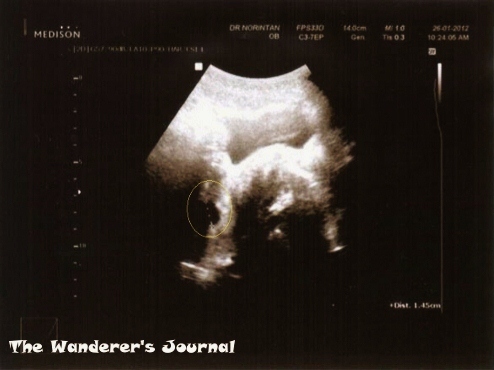 We could not see the baby inside it as it is still way too small to detect. That's why; my Gynae scheduled me to see her again in the next 10 days for the second ultrasound scan. She also told me to temporarily stop consuming milk powder for pregnant women for the first three months since I am allergic to it. Apparently, this fortified milk causes me diarrhoea. So, the best bet for now is to quit it. I mentioned to my Gynae that I had developed flu symptoms the night before but she refused to give me any medications since my pregnancy is still very early. Turned out, my flu got unbearable as the night progressed and I was not able to rest at all. My husband felt that my body temperature has risen so he tried to find me a doctor at about 10pm. Thanks to CNY, all clinics at 10pm plus here were all closed so my husband got no choice but to take me to the hospital's emergency unit to find a doctor. This said, in just one day, we had to go to the hospital twice and see two different doctors. After two hours of queuing at night, the medical officer who attended to me in the emergency unit prescribed me panadol and another medicine for my runny nose. He said those medicines were safe enough for my pregnancy. Finally, I could have a better sleep that night although the flu symptoms didn't vanish immediately. The key is, try not to get sick when you are pregnant! It's just troublesome as we can't randomly take any OTC drugs to alleviate the pains. Doctor bills: RM 54 (for the Gynae's check) and RM 44 (for the flu medicines and doctor's consultation fee in the emergency unit). Some pregnant friends say they don't feel a thing during their early pregnancy. No morning sickness, no craving. Apparently this was not my case. I didn't get the luxury. Felt lethargic. No energy. I found it very hard to concentrate at work. Felt sleepy almost all the time. I needed to take afternoon nap for one to two hours and sleep very early at night too. Developed weird food cravings after heavy dinners. There's one night that I made my husband to take me out to find fruit rojak or sushi (which was forbidden) a couple hours after dinner. I also craved for ayam penyet and red fried rice. Felt super nauseous when hungry. Had this weird taste on my mouth. Still no interest in baking or blogging. Started taking milk product for pregnant women. By the way, my Sister-in-Law who just gave birth her third daughter about three months ago advised me to limit my intake of Chinese Liang Cha and young coconut drink for the first tri-semester. The goal is to keep my uterus as warm as possible for the baby, especially during the early days. We found out that I was about 4 weeks pregnant more than a couple weeks ago and with this, I intend to keep week-by-week pregnancy journal to record my weekly pregnancy symptoms, advices and pictures. Menstrual-like abdominal cramping for few days. Doctor says this is because the uterus is making a room for the baby. Loss of interest in many things including blogging and baking, which usually fill my days. After I learned that I was pregnant, I have limited my travelling activities and those include me cancelled a week fun family trip with my parents and siblings to Thailand and excused myself from running a conference in Jakarta next month. The whole idea is to minimize fatigue and avoid tension during these early pregnancy days. Moreover, some people say, we shall wait until we cross the third month of our pregnancy before travelling overseas, right? I obeyed. Doctor bill: RM 207 (For Gynae's consultation fee, test pack, medicines to promote stronger uterus/progesterone). Seemingly, the medicines to promote stronger uterus are very expensive! Meanwhile, I also take 5mg of folic acid on daily basis. Following much contemplating on whether I should announce what's currently happening to me (since it's still pretty early and some people say do not announce this yet! ), I've decided to break the news right here, right now. The longer I keep this news in the dark, the longer story that I will have to write in the later days and that would mean more homework that I need to do for my blog. 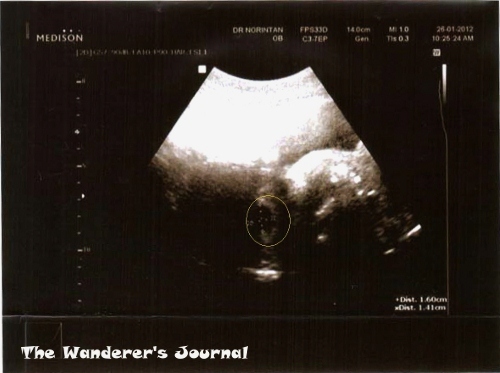 So, after months of trying and frustration in conceiving a baby, I finally got pregnant! I discovered that I was pregnant more than a couple weeks ago and this probably explains my blogging absence in the past two weeks or so. Since I got pregnant, I just became very lazy in doing anything and lost interest in all the things that I liked to do. I figured that I was pregnant on Thursday morning (at around 5.30am), 12 January 2012 and actually, it was not exactly a month since my last period in December. I did the test pack simply because I had this monthly 'hunch' to test again and it was about three days past my usual menstruation cycle days. I used my first morning urine for the pregnancy test as to get the most accurate result. My positive pregnancy test results! To my surprise, I, at last, got two pink stripes that I thought were always going to be some imaginary lines. I did not entirely believe what I saw so I ran out of the toilet and woke my husband up. I decided to test again with another different brand pregnancy test pack and this time around, both husband and I were going to witness the appearance of the second line together. And yes, we still got two pink lines, although the second one was a little bit faint. Both of us were jumping with joy to learn that we are going to be parents and I almost immediately broke this news to my parents in Indonesia. When I called them to tell them that they are going to get a grandchild this year, it was not even 6am in my home town. Both of my parents advised me to take care of myself extra carefully from now on. At 9am, my husband took me to the Gynae who did my pre-natal blood test (and declared that I was healthy enough to get pregnant) to confirm my pregnancy. She did another pregnancy test by using a test pack and confirmed us that I am about 4-5 weeks along, judging from the second faint line on the test pack. She told me to see her again in early February for my first ultrasound scan and prescribed me with medicine that promotes stronger uterus and folic acid. My husband broke the happy news that we are expecting a September baby to Mom-in-Law right after the Gynae's visit. Mom-in-Law immediately called Dad-in-Law to spread the news. Then, the next thing we knew, the news has spread to some cousins and aunties here in Malaysia through the grapevine. Until few days later, I could not stop looking at the two lines in my test packs that I purposely keep. Those are probably the most beautiful two pink stripes I have ever seen in my life. So ye-hey! I am finally pregnant. Thank God for answering my prayers! For the time being, I can literally say bye-bye to the frustration in getting pregnant, the peer pressures to get pregnant and test packs. It's almost two weeks since I updated this blog. I had a busy weekend last week and was incredibly occupied with my day job which left me pretty much idle after office hours for the whole week. Last week, my parents and brother from Indonesia had a short visit to Malaysia before they went to Thailand for a week holiday. My husband and I should have gone to Thailand with them too on Monday but due to various reasons, we had to call that plan off. Here's some recap of how I spent my weekend with my family from Indonesia last week. Basically, on top of some culinary tour, my husband and I tried to bring them around to visit some places that they have never been around Seremban and Kuala Lumpur before. My brother who recently is so into photography wanted to take some landscape shots, so we brought them around for some sightseeing too. After my husband and I picked my family up at LCCT airport, we took them straight to Seremban for late lunch and some walk in Jusco Seremban as they had never gone there before. Personally, I thought Jusco in Seremban is a somewhat boring mall. This is because we got not many mall choices here in Seremban thus, our best bet is to visit Jusco every other week. I guess that explains why I deem this mall is rather boring. On the other hand, my Mom thinks that Jusco in Seremban is a quite happening mall as compared to what we have in our home town in Indonesia. Fair enough. My Mom with the "Dragon" in Jusco Seremban. Finally they got rid of the "Rabbit". My Parents-in-Law invited my parents and brother for an early CNY dinner at Min Kok Restaurant and I was so excited to introduce Lo Hei Yu Sheng to three of them as we don't practice this in Indonesia. Yu Sheng: Getting ready for the Prosperity Toss. Early CNY Dinner in 2012. My family thought Lo Hei Yu Sheng tradition was really fun and interesting to do but my brother was not impressed with its taste. The pickled ginger must have been the culprit here. My brother requested Dim Sum breakfast so we brought all of them to one at Min Kok Restaurant. They were pretty amazed at the long queue just for having Dim Sum at this humongous restaurant on a normal Sunday morning. Dim Sum breakfast at Min Kok Restaurant, Seremban. My brother was looking forward for some landscape photography sessions so my husband suggested us visit some local waterfalls area in Seremban for him. My husband chose Ulu Bendul Recreational Park for my brother's photography session but in the end, he was not quite happy with it because the place was quite dirty and to see the waterfall, we would have to walk for about 30 mins from the entrance. This said, after a quick peek at this recreational park, all of us decided to move to Kuala Lumpur for some shopping spree instead. A river view at Ulu Bendul Recreational Park taken by my husband. It's fun to have a photographer brother. Family picture at Ulu Bendul Recreational Park. In general, Indonesians love coffee and some really have to take at least a cup every day. After Ulu Bendul, my brother felt the kick to have his daily coffee intake since he had not had his share in the morning. As requested, we brought them to OldTown Cafe. My brother is a big fan of OldTown's white coffee and butter kaya toast, not sure why. My Dad and his Old Town's cup of coffee. My husband and I had actually taken my family to Sunway Pyramid Shopping Mall back in September but since we could not think of a better mall in Kuala Lumpur for them to check out, last week, we made them to take a walk there again. It was okay though. My parents thought the shopping malls in Malaysia are super happening during CNY seasons and my brother indeed had a fruitful shopping frenzy in Kuala Lumpur. My parents at Sunway Pyramid Shopping Mall. 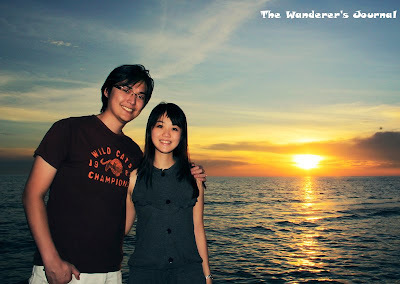 In late evening, my husband brought us to Port Dickson which is only about 30 minutes away from Seremban. He wanted my brother to capture the sunset beach photos as he was so keen to do some landscape photo shoots when he was here. My parents really enjoyed the evening by the beach - appreciating the scenery and playing with some sea water. Seemingly, it's been ages since they last went to a beach. My thoughtful husband purposely bought a picnic beach rug and ice creams for us. He even skipped his ice cream as he was so in the mood! My Mom and I playing with some sea water. It was low tide when we came to Port Dickson before sunset. We had to walk on a vast sandy area before we finally put our feet in the sea water. However, once the sun set and the sky was getting darker and darker, the water level gradually got higher and higher. Thus, the sandy part of the beach that we witnessed earlier was almost gone it was mostly covered with water again. See the hollows in the sand? Those are homes to creepy mini crabs. Our tour leader and driver for the weekend. My husband bought Burger Ramly, Malaysian-style burger, for my family to try. My brother said the burger tasted weird. Sorry, no pun intended. A golden moment for father and son? 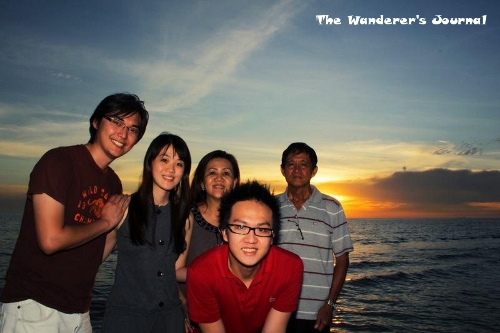 A beautiful family portrait when we were in Port Dickson, taken by my brother. Husband and I at Port Dickson. The relaxing evening by the beach was then followed by a seafood dinner near Port Dickson, which my Dad thought was really delicious, before we finally headed back to Seremban and called it for a day. It's time for sayonara with my family. *sobs* After quick breakfast with my parents-in-law; my husband and I had to send my family back to the airport to catch their afternoon flight to Krabi. I wish I could go with them for a week long holiday. I hate goodbyes. And I could not wait for my next visit to Indonesia again, hopefully very soon. Not sure why the recent blog posts I made are all about food but I guess these days, I just suddenly had the drive to get busy with food ingredients and making something out of them so I just did it. Yesterday afternoon, I stumbled into Anncoo Journal's recent post on making beautiful Earl Grey Tea Cookies. I seriously wonder, how come Ann could always create beautiful food? Anything she touches turns to amazing food. What a talented baker. Anyway, after reading and briefly studying her step-by step tutorials and analysing the required ingredients for making these tea cookies, I decided to make some too. We do not keep any Earl Grey tea at home, so I just utilized the normal red tea leaves that we happen to have for these cookies. After making the dough in the evening, I went out for dinner whilst waiting the dough to toughen a bit in the fridge. When I came back after dinner, I continued working on the cookies again until about 10pm. Tired, yes. Especially after a busy day with work infused with the regular Monday blues syndromes. I didn't change anything much from Ann's original recipe but I did add vanilla extract and a little bit of corn starch plus used red tea leaves instead of the Earl Grey tea leaves as suggested into my cookies dough. My first ever Red Tea Cookies. Heat up the fresh milk but do not boil. Pour the tea leaves onto it. Set aside. Once the milk turns a bit brownish like Teh Tarik, run the milk and tea through a sieve. Keep the tea leaves. Cream butter, vanilla extract and icing sugar with high speed electric mixer until light and fluffy. Add in egg yolk, mix well. Add in the tea leaves, flour, corn starch and ground almond into the butter mixture. Mix well with a rubber spatula. Put the dough into a plastic bag, press it flat and leave it in the fridge for 30 minutes or more. Fill the dough into a piping bag fitted with a star nozzle. Pipe the cookies out on a lined baking pan. Bake the cookies in a preheated oven for about 15 minutes until the cookies is golden brown. Quickly take the cookies out of the baking pan once it's done. Let them completely cool before storing them in an air-tight container. Thank you, Ann for sharing this recipe. Although the cookies final results of mine are not as pretty as yours turned out a bit 'whiter' but overall, I am quite happy with them. I would probably add one more tea bag for the cookies dough when making it again the near future to produce stronger tea aroma. P/S: Hop over to Ann's blog to get the pictures of the step-by-step tutorials in making these cookies. Since last Christmas, I have been wanting to make a roast chicken but I always killed the idea. It was like having a burning desire yet to be materialized. When my husband and I took a stroll in a new hypermarket in town last night, we decided that we were going to cook the Sunday lunch for the whole family. I didn't scratch my head too much to decide what I wanted to cook. I was determined to make my first home-made roast chicken. I used the recipe of the roast chicken from an old cooking magazine, published in 2002, that I purposely brought from Indonesia a while ago. I made little changes on the original recipe to make the whole roast chicken tastier. My first home-made honey roast chicken. 1/2 Bulb of garlic, mashed. 1. Pierce the whole chicken with a fork so all the seasoning and sauce can be well absorbed. 2. Cover the whole chicken with salt, fresh lemon juice and mashed garlic. Marinate for about 1 hour. Marinate the chicken and let it rest for about 1 hour before cooking. 3. Pour all the sauce ingredients in a bowl. Lightly mix with a spoon/fork, set aside for later use. Sauce mix for cooking the chicken. 4. To start cooking the marinated chicken, sauté the chopped onion with the margarine in a large wok until fragrant. Sauté the chopped onions in margarine. 5. Add the marinated chicken onto the sautéed onion and margarine. Cook until the chicken's colour changes. 6. Pour the sauce mix onto the chicken. Then add in the water. Gently mix until the whole chicken is covered with the sauce. My Mom-in-Law asked me to cook two extra chicken thighs too. 7. Cook the chicken until the sauce is slightly caramelized and there is only about 50ml sauce left. Then transfer the chicken into a baking pan. and it's ready to be transferred to the baking pan. 8. Bake the chicken in a preheated oven for about 45 minutes until all the meat is all cooked through and the chicken is nicely browned, but not too burnt. Brush the whole chicken with the 50ml extra sauce, few times in every 10 minutes while roasting it. The whole cooked chicken ready to be baked. 9. Serve hot with fried/baked potato or steamed rice. Honey roast chicken: Fresh from the oven. Making this honey roast chicken indeed consumes few hours in time but I think it's worth the wait and the troubles. The chicken smelled really fragrant when baked in a hot oven. Also, when eaten, the chicken tasted really sweet and tangy plus the meat was really juicy. Considering that I seldom cook, I guess my honey roast chicken today was a victory! After much contemplation over the weekend, I finally decided to make éclair as my first sweet bake for 2012. I made this once long time ago and I think I was quite successful then, so I wanted to repeat my little success again this year (in front of my husband!). I browsed a lot of simple éclair recipes in the net and landed my choice on an éclair recipe from a trustedsource created by Mrs. Fatma Bahalwan, a decorated baking guru and entrepreneur from Indonesia. Below is the recipe and step-by step tutorials of the mini vanilla éclairs that I made this evening, with the help of my dear husband. My husband was the one who bothered to take all of the photos below too. Isn't he sweet? Without further ado, here is the recipe has been slightly adapted from the original recipe to suit my current ingredients stock at home today. Also, I only made half of the ingredients from the original recipe as I wanted to test the recipe first and do not wish to waste so much food. First sweet bakes of the year: Mini Vanilla Éclairs. 1. Make the choux first by boiling water, sugar and butter in a pan. Add in the flour into the boiling liquid and mix well by using a wooden spoon on small fire. Keep on mixing until the dough does not stick to the pan. Once your choux dough looks like a mashed potato, you may turn off your stove. 2. Once the dough is lukewarm (not piping hot), add in the eggs one by one. Mix well by using a metal spoon. Ensure that the dough is not too hot when we add the eggs onto it. We do not want to cook the eggs with the hot dough. After the eggs, the choux dough will look a bit gooey. And it's ready for piping. 3. Put the choux dough into a piping bag, cut the tip of the piping bag and pipe the dough (vertically) on a baking pan which is already lined by a parchment paper. The size and length of the choux can be made as desired. Don't pipe too small choux dough otherwise, it's going to be a pain to fill the choux with the custard later on. Piping the choux dough on a lined baking pan. Wet your finger first if you want to slightly fix the shape of your choux before baking. 4. Bake the choux dough in a preheated oven for about 25 minutes until the choux is golden brown and slightly cracking. 5. Whilst baking the choux, make the vanilla custard by combining the corn starch, egg yolk and some fresh milk in a bowl by using fork. 6. Bring to boil the remaining fresh milk and sugar. Once the sugar is dissolved, pour the corn starch, egg yolk and a part of fresh milk mixture on to the boiling liquid. Gently mix and bring to boil once more until the mixture is thickened. Set aside. 7. Once the choux is ready, cut half of the choux in the middle with a scissor but try not letting the whole choux completely separated into two. 8. Fill the choux with the vanilla custard and decorate with melted chocolate as desired. If microwave is used to melt the cooking chocolate, make sure you microwave the cooking chocolate not more than 30 seconds. Melted white chocolate. It was melted in a microwave for 29 seconds. 9. Éclairs are now ready to serve. Éclairs can be kept fresh in the fridge or air-tight container for a couple of days but I would say eating them fresh is still the best option. Vanilla éclair is now ready to serve. To summarize, I had a really milky and buttery tasted éclairs today. The vanilla scent was pretty strong too and I liked it. One mistake that I made today was probably not making the choux big enough before I baked them so it was quite a challenge for me to fill the mini choux with custard. My husband over-microwaved my dark cooking chocolate so it smelled burnt. This was the reason why we ended up decorating the éclairs with the white chocolate only. The 'white' éclairs still tasted good, nevertheless. It's a pity that today the only kid I have in the house is only my barely-3-months-old niece. She is teeth-less and obviously 100% relies on milk. Thus, no children around who could help me to finish my colourful éclairs today. Never mind. 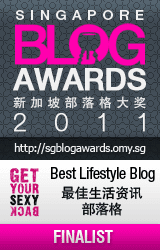 2012 is already here for four days and this post marks my first blog entry for the brand New Year. Speaking of the New Year, here are a little chronicles of how I spent my New Year in Malaysia. Again, I was lamenting during the week after Christmas because my office was on holiday (and supposedly me too!) but my husband and his family had to work as per normal. They are accustomed to take long break during Chinese New Year. This said, on global holiday season, I had to kill my holiday time by working (a bit) too and I did not quite like this idea. For almost a week, I got really bored at home and felt that my treasured yearly holiday moments had gone into the drain. I had bad mood almost on daily basis and became easily irritated on small things almost all the time (just like having PMS symptoms!). Bad, bad. To the rescue came a bunch of relatives of mine from Malang and Jakarta who happened to spend their New Year holiday by joining a guided tour for four days in Kuala Lumpur and Genting Highlands. I fought incredibly hard to make my husband spare his busy time to send me to Kuala Lumpur and meet my relatives there. I mean what are the odds of having quite a lot of relatives from Indonesia to visit me in Malaysia whilst I am just one hour drive away from them? A couple days later, my wish was granted. I finally got to see my relatives in Kuala Lumpur for few hours for two consecutive days, right before they had to leave Malaysia. It was such a delight to see all of my relatives here in Malaysia. In the late afternoon, my husband decided to finish his work earlier and took me to Bukit Bintang area in Kuala Lumpur to see my relatives from Indonesia. At last, I met the daughter of my elder cousin in Jakarta again, Baby Kaylee. The first time I saw Kaylee was when she's merely two months old and now, the second time I saw her, she is already two years old! Kaylee treated me like a complete stranger. Completely understandable, though. My husband and I bought Seremban's signature snack, Siew Pao, for my relatives to taste when we met them in Kuala Lumpur. My cousin ordered two more boxes of Siew Pao on the next day to be brought to Indonesia. My relatives, husband and I didn't do many interesting stuff in Bukit Bintang area other than chit chatting with them (non-stop) at KFC Restaurant and accompanied them doing some malls hopping in Kuala Lumpur. Poor my cousin, she and her husband barely enjoyed their vacation in Malaysia because Baby Kaylee was quite demanding during her first overseas trip. The kid had to be carried around everywhere most of the time. since this funky Mom was too tired carrying Kaylee all the time. and baby bag on the right hand. At 6pm, my relatives had to assemble in a meeting point for pre-arranged dinner with other tour members, so my husband and I went back to Seremban. We plan to see my relatives again on the next day in Genting Highlands. Walking my Uncle to his tour bus's meeting point. After work, my husband brought me all the way to Genting Highlands to meet my relatives again before they left Malaysia on the next day. I was really happy to see all of them again although overall, we were just catching up and sporadically checking out some shopping malls, even when we were in Genting Highlands. Group Photo with Genting Theme Park in the background. 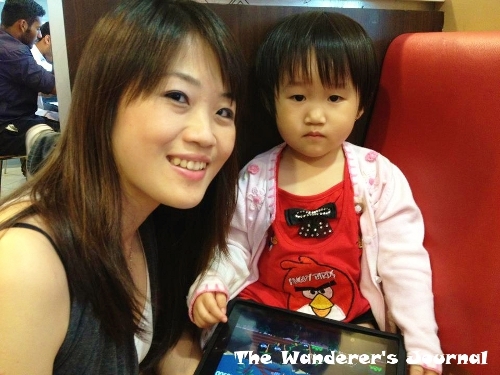 Baby Kaylee at Genting Shopping Mall: An obvious her Dad's mini-me. who could not be bothered to pose in front of the camera. I learned one new thing during my trip to Genting Highlands last week, that a Sand Art Workshop (for kids) at a mall is worth visiting when you have toddlers and you find it hard to keep the kids quiet during your leisure time at a mall. My cousins, aunt and I spent quite some time playing some colourful sand art with Kaylee at Genting Shopping Mall. Amazingly, this workshop worked wonders for both Kaylee and her Mom. The two of them seemed to enjoy working on the colourful sand art very much. Moreover, they did not have to spend so much time by just sitting in a boring cafe or food court as the kid didn't want to walk by herself when her Mom wanted to check the mall out whilst her Mom was definitely already so flat tired carrying her all the time when walking around inside the mall. By the way, a pram didn't do much help here. My niece refused to be put in the pram which her parents brought all the way from Jakarta. Kaylee was so happy working with the colourful sand art and her Dora sticker paper. Her Mom happily attended this mini art workshop too. and left Malaysia on the next morning. Not long after the Sand Art games, all my relatives had to go back to Kuala Lumpur for dinner with the other tour members and needed to start packing their luggage too as they were leaving Malaysia on the next morning. This being said, my husband and I had to bid farewell with all of them. I hope to see all of them again in Indonesia soon! So I guess, that's about it! Nothing much that my husband and I actually did to celebrate the New Year's Eve or the New Year in Malaysia itself this year. In fact, I guess I had to see a doctor at Klinik 1Malaysia and slept early on the New Year's Eve as I was feverish due to my sore throat. Nothing significant I could remember from celebrating the actual day of the New Year. All I recall now was the fact that my husband and I went to see some friends in a local restaurant for light supper that night. Husband and I on New Year's supper at Tarot Cafe, Seremban. The New Year Day plus one: The highlight of the post New Year celebration was indeed the three-hour karaoke session at Green Box Karaoke, Jusco Seremban that my husband and I privately enjoyed. Both my husband and I sang our hearts out during the morning happy hours at the local karaoke box. Impromptu karaoke marathon to celebrate New Year. Honestly, my husband and I are no good singers, but we could not care less when we were paired as karaoke duo. The two of us just continued singing and screeching albeit most songs that we sang were off-key. I generally sang my old favourite boy band music from my teenager era that I husband could only roll his eyes at. After the three hour karaoke marathon, my sore throat revisited me again. My voice turned almost like a frog's and I could not sleep well that night because my just-slightly-recovered throat gave me terrible sore again. Nevertheless, private karaoke session with husband = fun, fun! Reality hit. Everyone was back to work, including me. Busy, busy! Cheers to the New Year of 2012! May this year treats everybody real nicely.